Suppose you need two path for a content. For instance, the URL alias for a article need to node title and also article/node-title. Is it possible to set multiple path alias for a content type in drupal 7? Yes it is possible in drupal 7. We can set multiple URL alias for a conten type programmatically using pathauto module in drupal 7. We need to insert our path alias into the "url_alias" table while inserting & updating a node and remove path alias When delete a node. For instance, I've choosen article content type. We need to insert & update a URL alias into the "url_alias" table using hook_node_insert() & hook_node_update() in drupal 7. 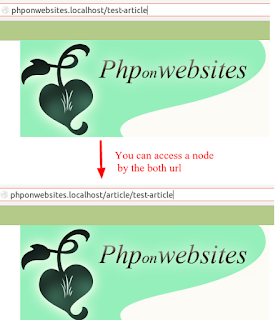 Now you could access the article by both node-title as well as article/node-title. path_load returns the details of a URL alias like source, alias, path id & language. To know more details of path_load(), please visit https://api.drupal.org/api/drupal/includes!path.inc/function/path_load/7.x. After added the above code into your customer module(clear cache), you will delete a node and check your URL alias at admin/config/search/path. Now tt should not be displayed here. Now I've hope you know how to set multiple URL alias for a content type.